Bill Barr just put Barack Obama on notice. 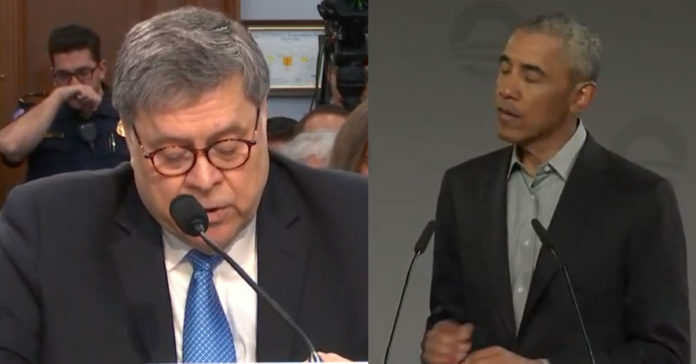 Barr revealed for the first time today during Congressional testimony about his investigation into the origins of the deep state hit job on Trump. Look, we know James Comey is a dirty cop or worse, a horrible cop corrupted by his own ego. We know all about the shenanigans from Lisa Page and Peter Strzok. We know about the Steele debacle and we know that Adam Schiff and other Democrats selectively leaked Congressional testimony from team Trump to the media to make it seem like there was collusion. Oh, they knew the whole time the charges were dubious because they had all the information, but they only leaked the bad parts. What we don’t know if it was all one big coordinated smear campaign, or if they just got lucky and bumbled into conspiring to take down Trump. And we don’t know what Obama knew and when did he know. It seems farfetched to believe Obama was not aware of any of this. Put it this way, if he was unaware and the charges warranted investigation, and he ignored them, he would be derelict in his duties. Which is possible, based on his 8 years, but it could be a whole lot worse.